Screen Classifying Cutter Controls Size Ranges - Munson Machinery, Inc.
UTICA, NY  A new Magnum Model 72 Screen Classifying Cutter from Munson Machinery reduces infeed products spanning a wider range of sizes, at approximately 75 percent higher rates than standard size models of equivalent length. The cutter features an 18 in. (457 mm) overall diameter rotor, versus the standard 10.5 in. (267 mm) diameter rotor, and contains a 72 in. (1829 mm) long helical array of 72 interconnected "four-sided stars" which hold 288 carbide cutter tips that continuously shear oversize materials against twin, stationary bed knives. With no frontal gaps between the cutter tips, material is cut into uniform pieces with minimum imperfections or fines, and little to no generation of heat. Perforations of the bed screen range from 4.0 in. (102 mm) to .125 in. (3.18 mm) in diameter, allowing the reduction of materials into uniform particles in sizes down to 6 mesh. recycled or otherwise reduced in size for processing. Typical applications include wood, fiberglass, cardboard, friable plastics, gypsum, rigid foam and numerous other uses. Material is fed through the top of an adjustable, double-baffled intake chute, or directly into the front of the chute through a hinged door. An independently powered, variable speed pinch roller is offered for horizontal feeding of material. 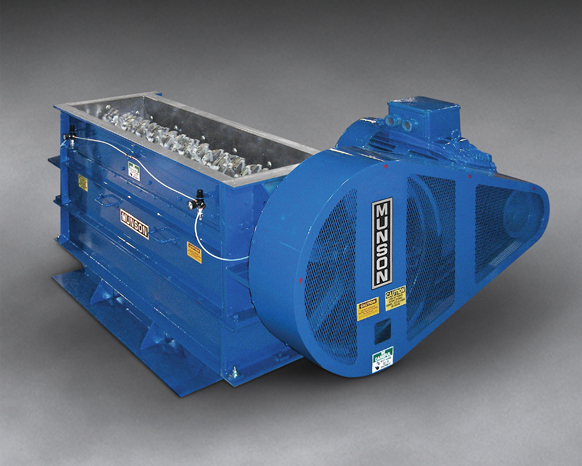 Discharge is via gravity, pneumatic collection or independently powered belt or screw conveyor. The cutter tips, which are secured with one retaining socket-head screw for rapid replacement, are supplied as standard in tungsten carbide, and available in various grades of tool steel and hardened stainless steel. The unit is offered in lengths down to 24 in. (610 mm) and configured with multiple V-belt drives as standard, or optional direct-coupled gear-reduced drives. All models are offered in carbon steel, abrasion-resistant steel and stainless steel. Magnum Screen Classifying Cutter Model 72 reduces infeed products spanning a wider range of sizes, at approximately 75 percent higher rates, than standard size models of equal length. 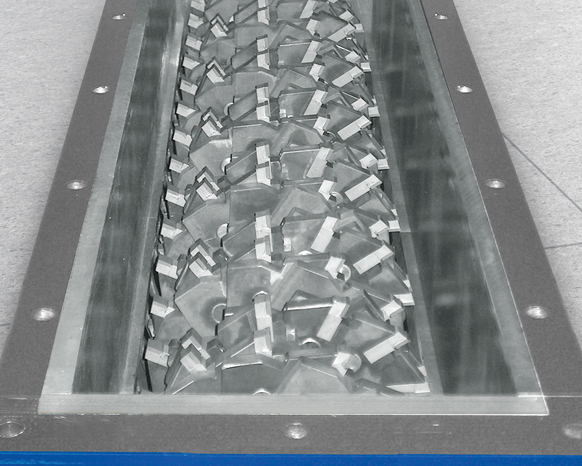 A helical array of 72 interconnected "four-sided stars" holds 288 carbide cutter tips that continuously shear oversize materials against twin, stationary bed knives until particles pass through screen apertures ranging from 4.0 in. (102 mm) to .125 in. (3.18 mm).